Another Houston institution bites the dust. 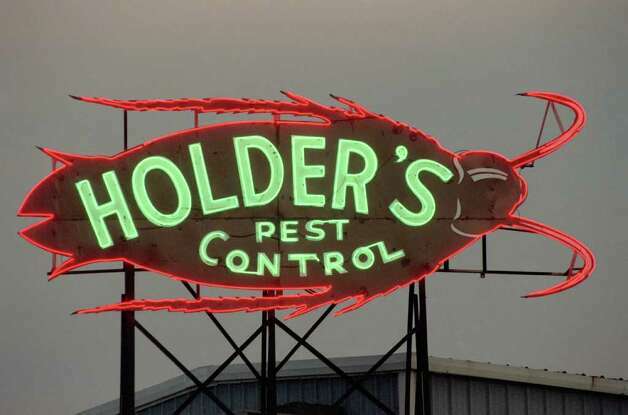 For 42 years, a 2-ton sign featuring a neon-lighted cockroach blazed over the Southwest Freeway near Westpark, a garish but iconic advertisement for Holder’s Pest Control. The 8-foot-by-16-foot sign, nicknamed Bubba, was taken down in 2004 and put in storage because Holder’s had moved its offices and a new city ordinance forbade such signs when companies relocate. Though their new landlords refused to allow the sign, officials of the pest-control company expressed optimism at the time that they could bring it back someday, somehow. Time ran out for Bubba three months ago. In January, the steel and porcelain sign was cut up and hauled off for recycling. Last week, the company announced it had rebranded with a new name and new corporate logo on its uniforms and trucks. The new branding is roach-free. Yeah, that’s how we roll in Houston. I have to say, though, I can’t believe there wasn’t someone willing to pay a few bucks to give Bubba a permanent home. I mean, ten years ago people bought a ton of Enron crap, so there’s plenty of precedent. Surely there was some soul blessed with more money than brains or taste who would have coughed it up for such a unique piece of Houstonia. Alas, he or she will never get the chance now. Swamplot has more.